The letter, dated July 6, 1945, was folded neatly into a small square, nestled snugly amid the salads in the old recipe box. The writer was my wife's grandmother Ethel, who had been away from home and her married daughter for a year. World War II was in its fourth summer, and she and her husband, uprooted from Oklahoma, were living in Carmi, Illinois, where they pursued work in the war industry. The fighting in Europe had ended two months earlier with the defeat of Nazi Germany. All eyes were now on the Pacific, where two sons served - Jim in the Army Air Corps and Hugh aboard a U.S. Navy cruiser. The tiny slice of war history surfaced during my wife's search for a sugar cookie recipe - not the familiar well-used one she had copied long ago, but the original, in her mother's handwriting. It was Thanksgiving morning, an unusually quiet one - no kids, no company, no plans. Over coffee and the daily paper, we discussed the day's news, our girls, their beaus, a dozen other things. But Marti was obviously frustrated by that missing recipe. I knew three other recipe boxes hid among the never-used collections in the cabinet over the refrigerator, and soon I was pawing through unfamiliar territory, hand-written recipes collected decades ago by her mother and grandmother. Surprisingly, some spawned memories of dishes and desserts served in those early courtship days. I exhausted the C's (for cookies), dug into the S's (for sugar cookies) and was flipping past soups and salads when the letter appeared. It was a collection of family chatter, mother-daughter advice, gossip and information Ethel would have wanted to share face-to-face - if she could have. She told of a dinner party at a "lovely little modern home in East Carmi" where the hostess had a "nice program and served a delicious salad." At that point, she shared the recipe, which is how the letter fell in with the salads. Rationing was getting better as the war neared an end. She wrote of a "lovely veal roast, the first I've seen in a long time." But it takes nearly two weeks to get a pound of bacon, she confided, "so I got salt pork... it's a pretty good substitute if you are terribly bacon hungry." Her sister Kate and her best friend Berta were serving as hostesses at the Dallas U.S.O. She asked about a recent break-in at the post office, answered questions about whooping cough and commented on reunion photos her daughter had sent. In one page front and back with scribbles up and down the margins, she shared at least two dozen bits of information. One tiny item about a "sweet letter from Mildred" caught my eye. "They received the cookies I sent (with the nuts you cracked)," she told her daughter. "I wanted H to get them before he left." H was her son Hugh a lieutenant (j.g.) 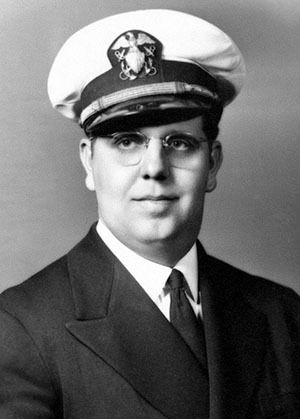 in the Navy, and Mildred was his wife of six months. Hugh's ship, the cruiser U.S.S. 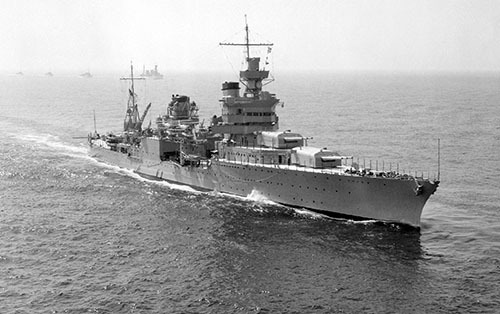 Indianapolis, was at Mare Island Navy Yard near San Francisco, where it was being refurbished after a Japanese bomb crashed through the deck during the invasion of Okinawa. Nine crewmen had died, but the battle-ravaged ship was being made right for its next mission. The cookies - with the nuts Katheryn had cracked - may well have gone to sea with Hugh when the cruiser headed west across the Pacific on July 16. The Indy, which had served as flagship of the 5th Fleet and supported dozens of naval battles, embarked on a high-speed run to Tinian Island. There, with its top-secret payload unloaded, the cruiser was ordered to proceed to Leyte Gulf in the Philippines. Ahead, the American fleet was preparing for what all agreed would be a long and bloody invasion of the Japanese mainland. The crew of the Indy wanted to rejoin the fleet and be part of that final assault. A few minutes after midnight on July 30, as much of the crew slept, in a dark and empty expanse of the Pacific halfway between Guam and Leyte Gulf, a Japanese submarine sent two torpedoes crashing into the big cruiser. It went to the bottom in 12 minutes. Of the 1,196 aboard, more than 300 went down with the ship. Katheryn and Ethel were told Hugh was one of those who died quickly, and they wanted to believe that. Of the 900 men who went into the water, only 312 would survive. No S.O.S. had gotten out, and through a combination of circumstances and incompetence, the sinking went unreported. Nobody was looking for them. The men in the water would wait five days for rescue. Sharks, injuries and dehydration took almost two-thirds of them before they were accidentally spotted by a bomber crew. The death toll from the Indianapolis was the largest single loss from a ship at sea in the war. The last survivors were pulled from the water on Aug. 3. Three days later, on Aug. 6, the atomic bomb delivered by the Indianapolis to Tinian Island, was dropped on Hiroshima. The war in the Pacific would be over in eight days. The cookies made for Hugh - "with nuts Katheryn had cracked" - were the last ones Ethel ever baked for her son. Dave Berry is the former editor of the Tyler Morning Telegraph. This, one of his weekly "Focal Point" columns, ran on Dec. 22, 2013. Photos: Top - Lt. (j.g.) Hugh Crews. Middle - The USS Indianapolis at Pearl Harbor (U.S. Navy photo). Bottom - Lt. (j.g.) 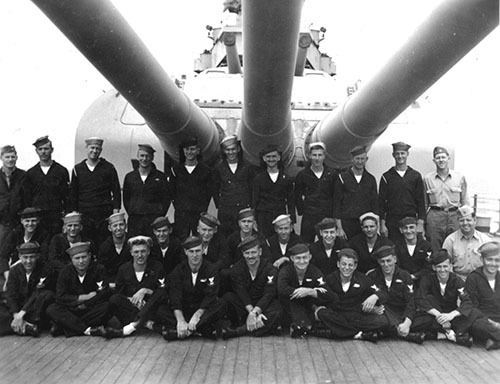 Hugh Crews (at right in the middle row) and crew of the radar department aboard Indy.